View from the Moulins Pois in Jersey, the largest of the Channel Islands. 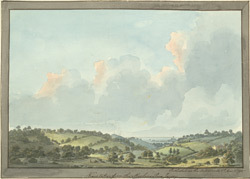 The artist George Heriot (1766-1844), attended the royal Military Academy in Woolwich where he learnt landscape drawing. He specialised in pictures of local and rural scenes and travelled widely through Europe drawing and painting. He emigrated to Canada in 1799 and found work as a clerk in the Ordnance department in Quebec. He became Postmaster General of British North America in 1774 and is well known for his paintings of Quebec and Ontario.